Models seem to develop this into a very rare South Atlantic tropical cyclone. The GFS, ECMWF, CMC, UKMET and ICON all seem to show some development. The GFS is the most aggressive, bringing it to near hurricane strength. 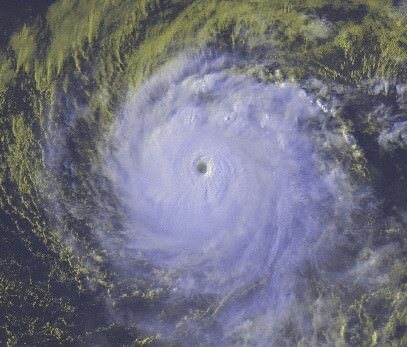 CyclonicFury wrote: Models seem to develop this into a very rare South Atlantic tropical cyclone. The GFS, ECMWF, CMC, UKMET and ICON all seem to show some development. The GFS is the most aggressive, bringing it to near hurricane strength. 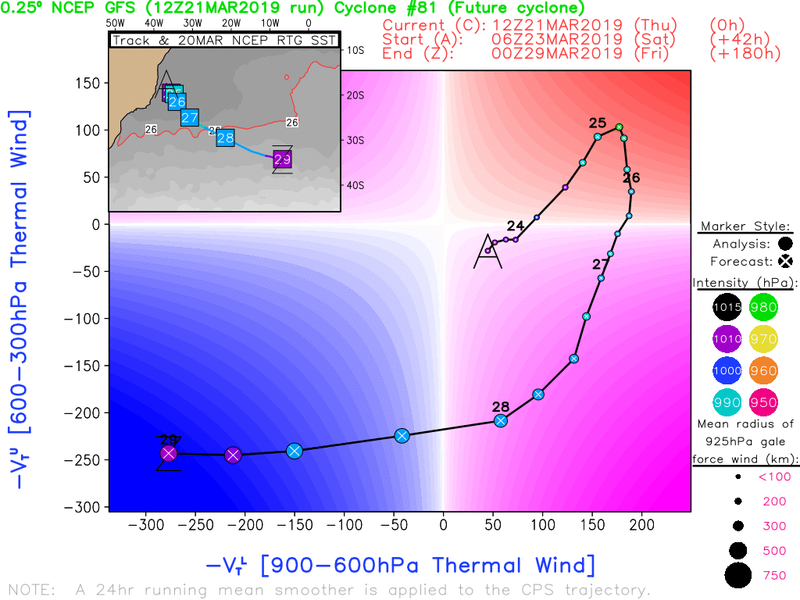 If the cyclone will develop fast and enough north, over the very warm water then it may reach hurricane intensity if the upper level streams will be as favorable as most of the models show. It will be 'Iba' if the Hydrographic Center of the Brazilian Navy continues the naming list what they began in 2011. 12z UKMET is quite strong. I never recall models being so bullish on tropical development in the South Atlantic. 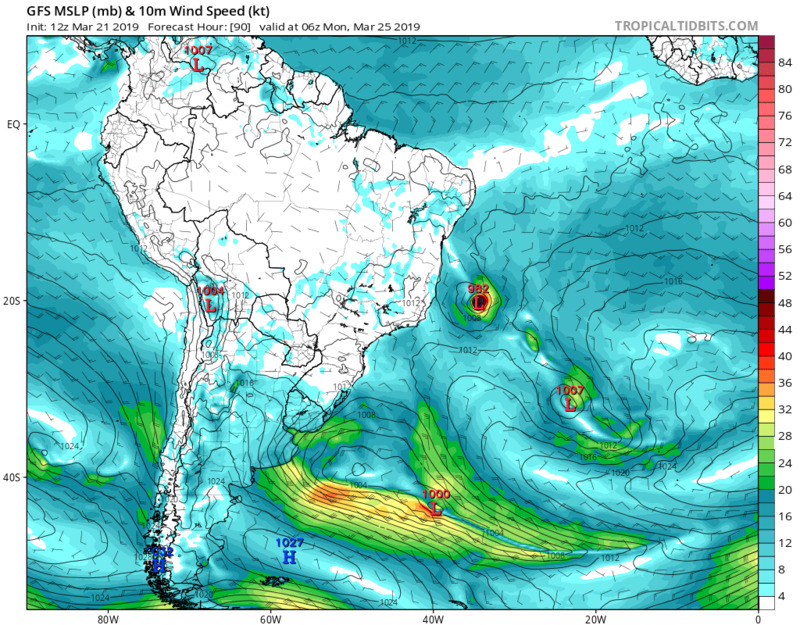 I think one of the more intriguing things about this potential system (of course, any possible organized system in the South Atlantic is impressive in its own right) is that this might be one of the most conventional tropical formation events that we've seen in the basin. Unlike storms like Anita forming out of a former extratropical cyclone or even Catarina which developed within the context of an upper trough, this system seems oddly "normal" in the context of how tropical cyclones form. Going off of where the models develop the system, this might be the most equatorial organized tropical/subtropical system in the South Atlantic since the Angola storm of 1991. The waters off the Brazilian coast are anomalously warm, around 28C—definitely warm enough to support tropical cyclogenesis—and as a whole these are about 1-2C above average. The models develop convection in light upper-level winds under the current anticyclone that's extended from Peru to the South Atlantic, with no odd upper-level quirks or gimmicks that often kickstart the formation of storms in odd areas like the Mediterranean or the high Pacific and Atlantic latitudes. The system's formation within a somewhat stationary tropical zone of confluence actually feels a lot like what you often see in the South Pacific with the monsoon trough. 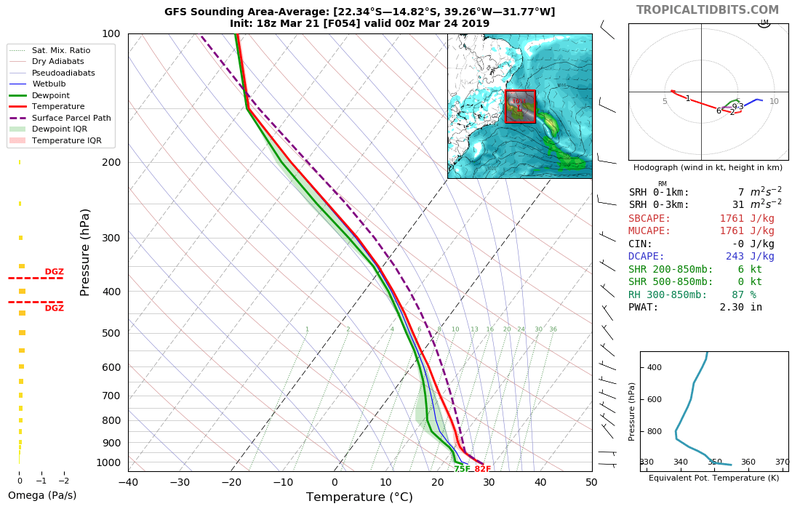 When we look at the vortex areal average model sounding from the GFS, these parameters come together in a manner that we usually expect when we discuss tropical development in general: low shear across the vertical column, a stout moisture profile, light upper-level winds, and a good amount of CAPE to get storms firing with the warm waters below. 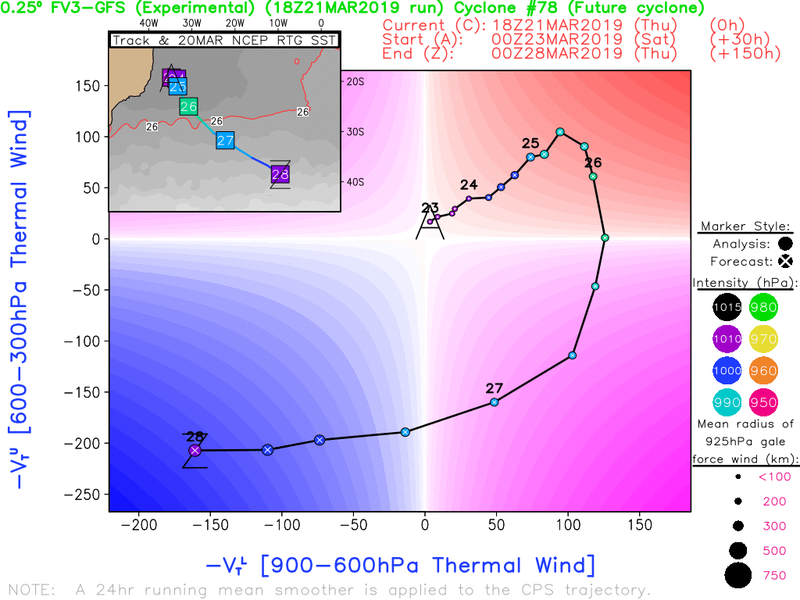 Confirming these tropical suspicions, the(GFS) phase(UKMET) diagrams(FV3) seem to initiate formation or organize the system as a deep warm core cyclone. Think the intensity forecast will be more clear when the final disturbance starts taking shape and we can more clearly pinpoint the storm's origin, but needless to say this will be a very interesting system to watch, especially given the abnormally aligned model consensus. Another interesting fact is this system, if it develops, will coincide almost exactly with the 15 year anniversary of Hurricane Catarina. Conditions actually look somewhat favorable for this one. If shear is low, we could see a hurricane strength system. If it intensifies as forecast, then it could be named Iba, from Brazil’s naming list of SATL storms. I keep having to remind myself it spins backwards. There isn't much there - just a weak low pressure area at the trailing end of a very weak front. It'll be heading out to sea without affecting anyone. I doubt that Brazil will bother with it. wxman57 wrote: There isn't much there - just a weak low pressure area at the trailing end of a very weak front. It'll be heading out to sea without affecting anyone. I doubt that Brazil will bother with it. 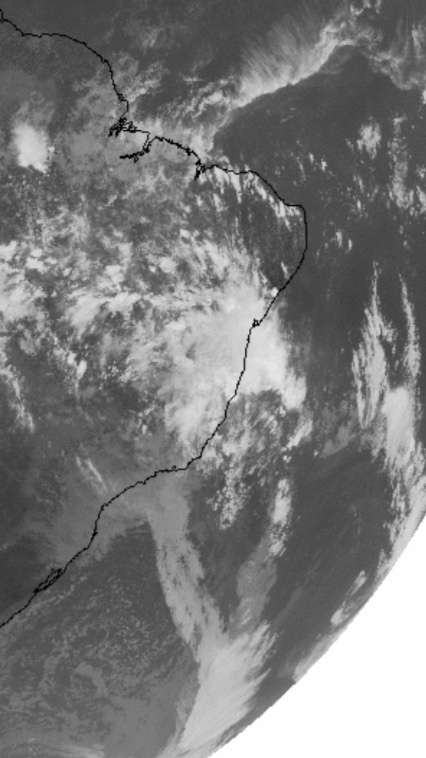 Brazil has been quite generous with naming in the past, so if this develops a well-defined circulation with any convection, I'd guess it probably earns at least some sort of designation. POSSIBLE TROPICAL CYCLOGENESIS AT 15S038W STARTING AT 231200 MOVING TO SOUTH. CYCLONIC WIND 7/9 WITH GUSTS AFFECTING AREA ECHO AND AREA DELTA NORTH OF 22S. Last edited by Nancy Smar on Sat Mar 23, 2019 6:13 am, edited 2 times in total. Was a bit surprised to see not one but two systems of curious organization off the coast of Brazil this morning! Certainly a very interesting sight to see. The system closer to the coast is the one that has been keyed on by models for the past week, though the other swirl of convection to the southeast has some going for it in a brief window of time this weekend. ASCAT suggests that it's pretty elongated at the low-levels, though. Here's a GOES-16 synthetic true-color shot of the two of them. Don't think I've ever seen a scene quite like this down there. 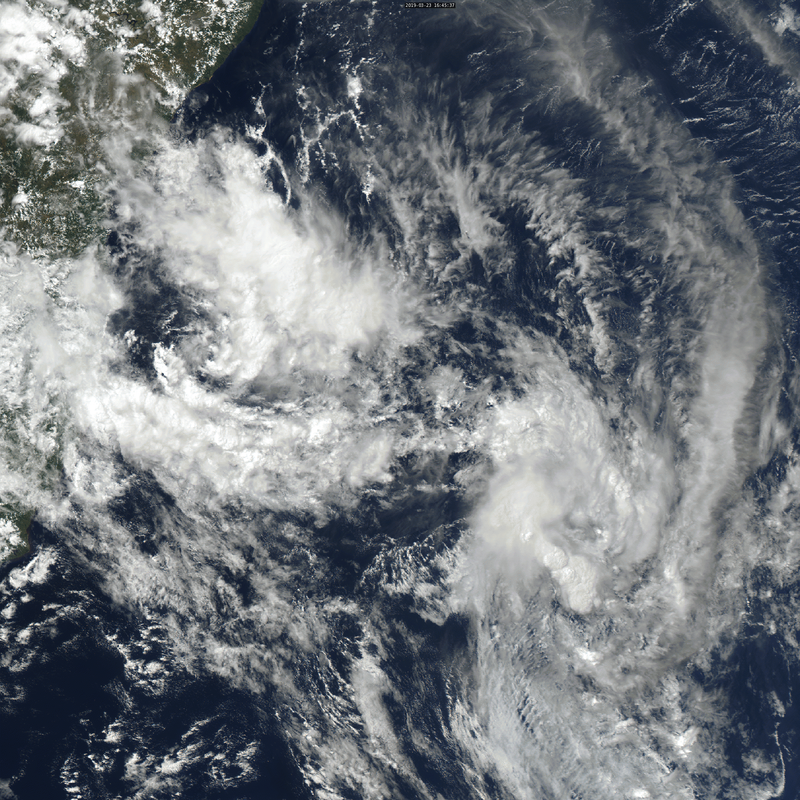 The Brazilian Navy has initiated warnings on the system closest to the Brazilian coast as a tropical depression. TROPICAL DEPRESSION WITH ESTIMATED CENTRAL PRESSURE OF 1010 HPA AT 17S036W AND ESTIMATED MAXIMUM WINDS OF 15 KT. 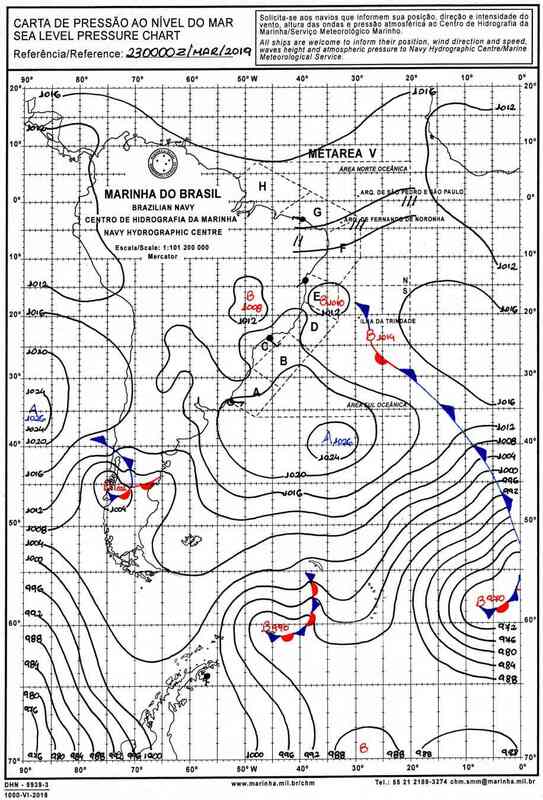 FORECAST WIND SE/NE FORCE 7/9 WITH GUSTS IN THE EAST SECTOR OF THE SISTEM AND WINDS SW/S FORCE 7 NEAR TO COAST AT AREA ECHO SOUTH OF 15S AND AT AREA DELTA NORTH OF 20S. ESTIMATED AT POSITION 18S036W AT 240000 UTC. THIS WARNING REPLACES THE WARNING 196/2019. I lean towards the designation of TD by the Brazilian Navy, as there is a well defined spin which is closed, as well as convection beginning to obscure the center. This is at least a developing TD. 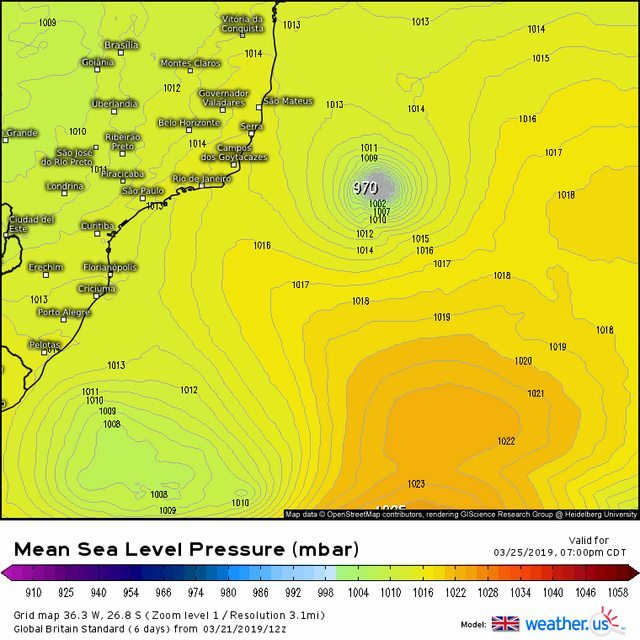 Interesting that the earlier bullish GFS shows almost nothing now, wihle the current ECM run is the strongest ever as drops the central pressure to 992 hPa and shows sustained winds around 100 km/h. 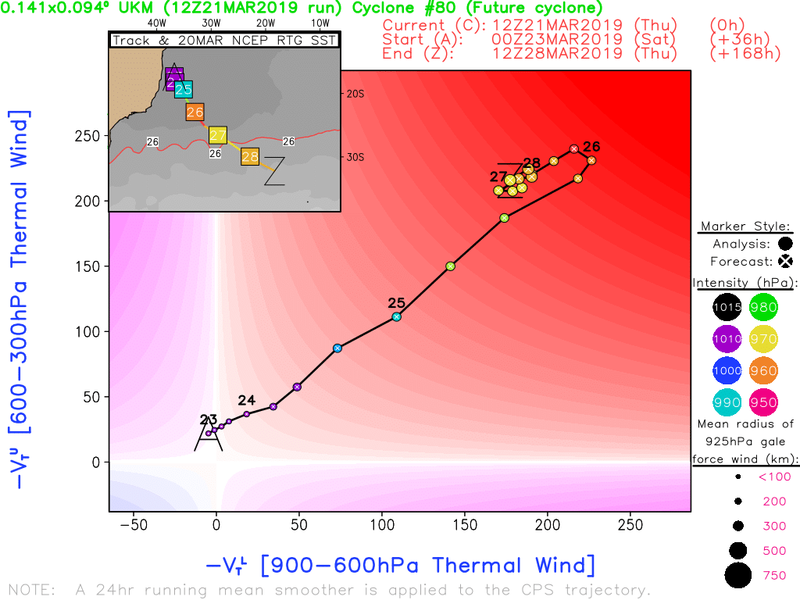 The UKMO also became weaker since yesterday, but still show weak-to moderate tropical storm, but now predicted landfall near Sao Mateus with huge amount of precipitation.